OverviewThe project “Balkan Women Coalition for Professional Qualification and Training in the field of Business and Economic Science” (B-WCo) is developed between 8 countries from the Balkan Region and it is based on the longstanding cooperation and work between the participating organizations on their common aim for supporting the Women Business Qualification and competitiveness in the labor market. The main idea of the project is the establishment of a coalition between organizations and NGOs from the countries in the Balkan Region – Greece, Romania, Croatia, FYROM, Serbia, Turkey, Albania, and Bulgaria. The aim is the creation of a stable and multinational network of institutions and organizations from the region of the Balkans in order to develop qualifications and organize seminars to help the women in the business filed. Moreover, it aims at the promotion of equal opportunities, new educational levels and post educational qualifications, based on organization of seminars and classes, to the promotion of women’s contribution to the research, innovation and awareness. OverviewThe Mediterranean Women Entrepreneurs Forum wants to provide women entrepreneurs from the Mediterranean area with the opportunity to make business contacts in key sectors for the economic development of the Mediterranean as well as to explain success stories, share good practices and know‐how and to analyze the role of women in the development of the region’s economies. Celebrating its 6th edition, the Forum offers a permanent platform for dialogue, discussions, sharing of experiences and networking that will bring new business opportunities for women entrepreneurs. In this new edition, we will discuss highly interesting subjects, such as the power of women in business organizations, women growing their businesses, and women’s access to finance, with the major aim of discussing and later suggesting ways of supporting women entrepreneurship in the entire region, as well as generating an always stronger business network for businesswomen on both shores of the Mediterranean. Participants will have the unique opportunity to listen to key economic speakers and to further discuss and exchange issues with them and other participants. From these multilateral exchanges we expect to raise precious contributions to the current debate on the issue of business and gender. 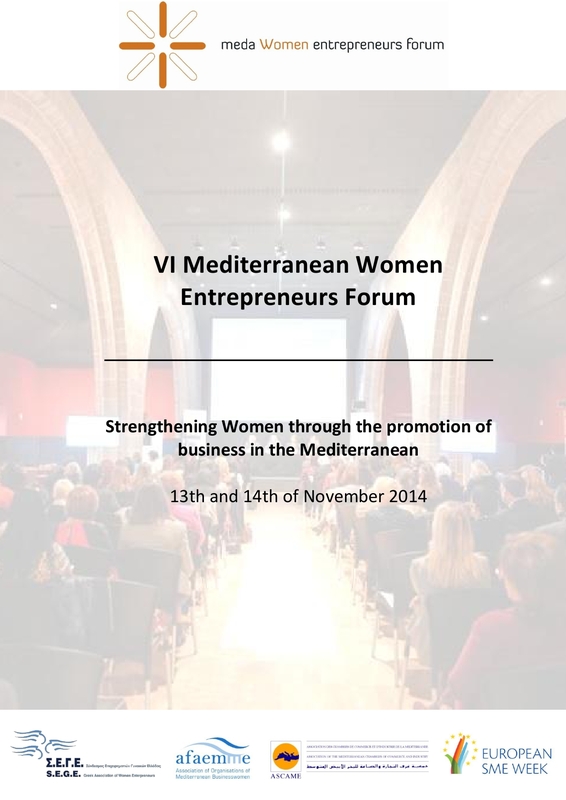 We therefore highly encourage Mediterranean women entrepreneurs and businesswomen to participate and share their experiences in order to create new synergies and to enhance trade among the Arab region and Europe and, in this way, indirectly contribute to the economic development of the Mediterranean countries and to regional integration. Time: 09:00 a.m. – 5:00 p.m. In order to participate as a speaker, please send us your paper. The power of women in business organizations. 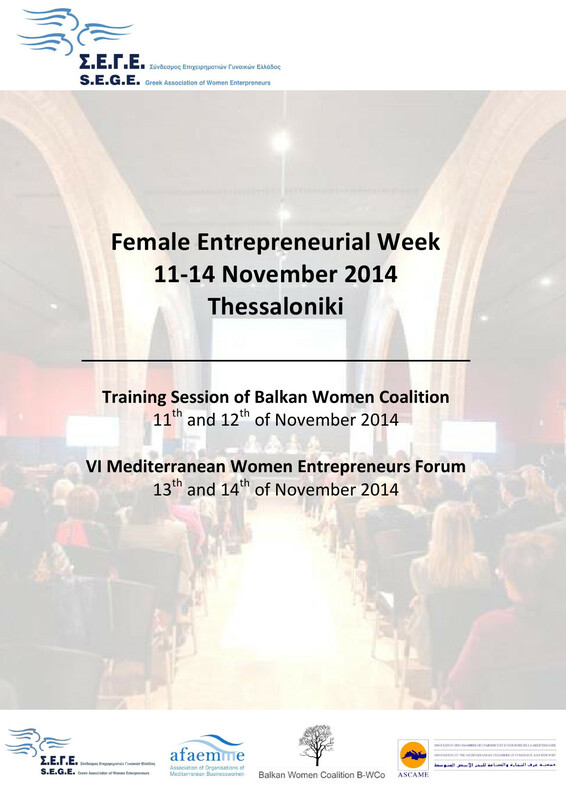 Ways of supporting women entrepreneurship in the entire region. Your Paper should be up to 500 words, and your speech should not exceed 15 slides and 10 min. Title of your speech and speaker’s name by 10th September. Power Point Sent by 20th October.